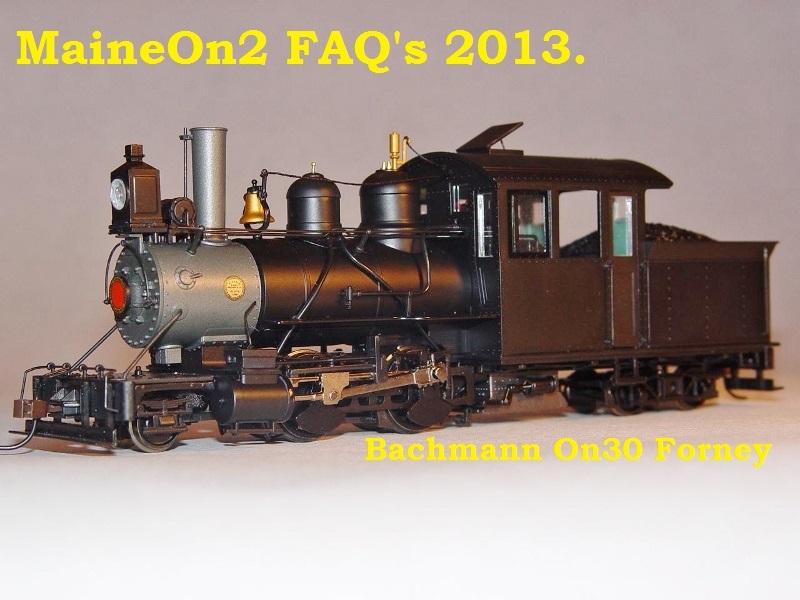 Bill Neilsen has written about his experiences with the Bachmann On30 Forney. This confirms that the issues experienced by On2 modellers with their brass loco’s are closely paralleled by our colleagues who run On30. The issues are to do with the prototype loco, rather than the gauge of the model. The Bachmann On30 Forney is a beautiful model and a fine running loco, especially the version with the factory Tsunami sound. However, because of the prototype’s configuration, and through no fault of the model, it requires larger radii and more carefully laid track than all of Bachmann’s other On30 engines. Because of its unusually long rear overhang, it will exhibit coupler problems due to excess swing not only when tracking through tight curves, but also when transitioning from dead level track into/out of grades. I would say that the minimum radius for reliable operation with rolling stock should be at least 22″ (24″ would be preferable), and it must be put down with great accuracy (no kinks, bumps or humps). It is such a nice locomotive though, that it is well worth the extra effort to tweak your track-work until it is perfect enough to satisfy the Forney, and all of your other equipment will run better, too, as a result. Operation on our modular layout has demonstrated that both the outside framed 2-8-0 Consolidation and the 4-6-0, which are much larger than the Forney, seem like they will operate in some spots that cause the Forney problems. The outside framed 4-4-0 has more overhang than it’s inside framed little brother, so it too, is more sensitive to vertical track changes, especially when using the front coupler. Surprisingly, one of the better tracking On30 locomotives seems to be the 2-6-6-2 articulated. One might think with all those wheels under the loco it might be more difficult to get it to stay on the track, but that doesn’t appear to be the case. I have since done a bit more experimenting with my Forneys and On30 modules, and have found that almost imperceptible dips or bumps in the rails (especially at or near the module joints) can result in enough vertical shift in the coupler (especially at the rear of the loco) to cause uncoupling between the loco and the first car. The front coupler is not quite as prone to this problem, probably due to its slightly less overhang. The best solution I have found so far, is to use the lost wax extended knuckle casting available from Jerry Kitts at Foothill Models. FMW has different versions of this knuckle available depending on which brand of coupler you wish to modify. Another possible solution might be to use a deeper coupler like the Kadee S/On3 type, but I think the FMW extended knuckles are easier and better looking.